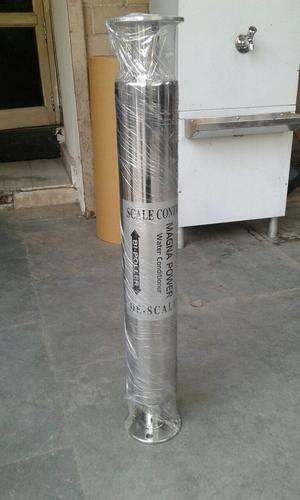 We are offering of Water Softener. Since this is having strong magnetic cage consist of permanent rare earth magnets which has longevity and retains the strength up to 99 years. This gadget induces instant charge in the water stream resulting breaking of the weak molecular bond of elements & compounds present in the water. The positive and the negative charges are there upon each molecule present in the water which helps water to reduce its surface tension with the result more penetration of water molecule in the object where water is being used for carious applications. This gives instant physical change to the water molecule and the changes remain effective till water retain the charge through magnetic cage approximately the effect remains up to 90-120 hrs. The construction has been made simpler by keeping in mind the easy fitments within the running pipe. The magnetic cage kept inside the SS pipe with adequate in solution so that the flux which is being created should have concentration on various points which is enough to break the ionic bond. This is the kind of physical treatment to the water which enables enough to remove even the old scale from the pipelines. No such product has this quality earlier. Established in the year 1994, we, “Sai Aquafresh”, are one of the most recognized organization engaged in manufacturing, trading, exporting, importing and service providing of an unbeatable range of water purifying systems. A reputable name in the water purification industry, we have grown leaps and bounds ever since our establishment. Leveraging on sophisticated water purification systems technologies, we are committed to develop advanced water purification systems, which are available to satiate the requirements of domestic as well as industrial sector. Focused on continual product development, we aim at reaching the pinnacle of success in this industry. We have grown leaps and bounds under the guidance of Dr. Rajeev Kishore, who is a well-known medical professional. Dr. Rajeev Kishore is a reputable and dignified personality, who has had valuable experience as a consultant working with W.H.O in preventive and social medicine department. Leveraging on his expertise and experience, we are able to innovate our range of products thereby offering satisfaction to our clients.